Sweet Molasses Brown Bread Rolls are soft and delicious. 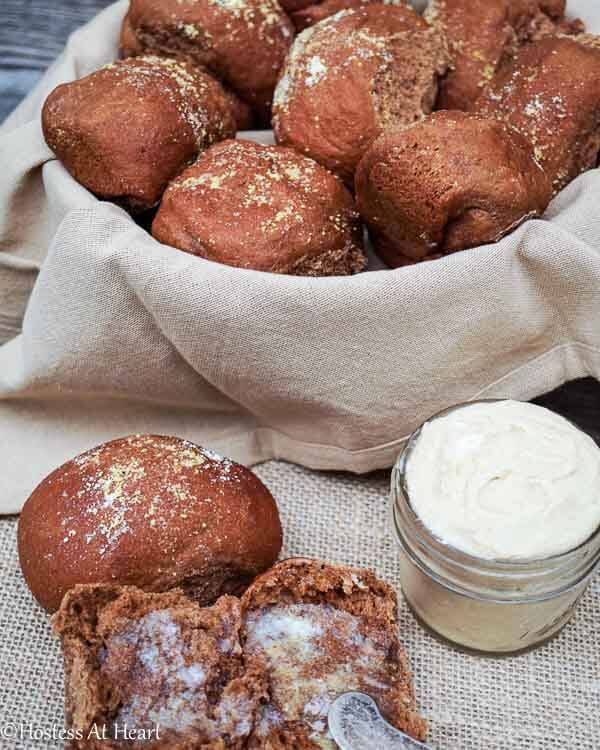 Molasses, honey and whole wheat flour give these rolls a mild sweetness and great flavor, especially when slathered with brown sugar butter! Some time ago I participated in a bread baking challenge group where we were given monthly challenge themes. 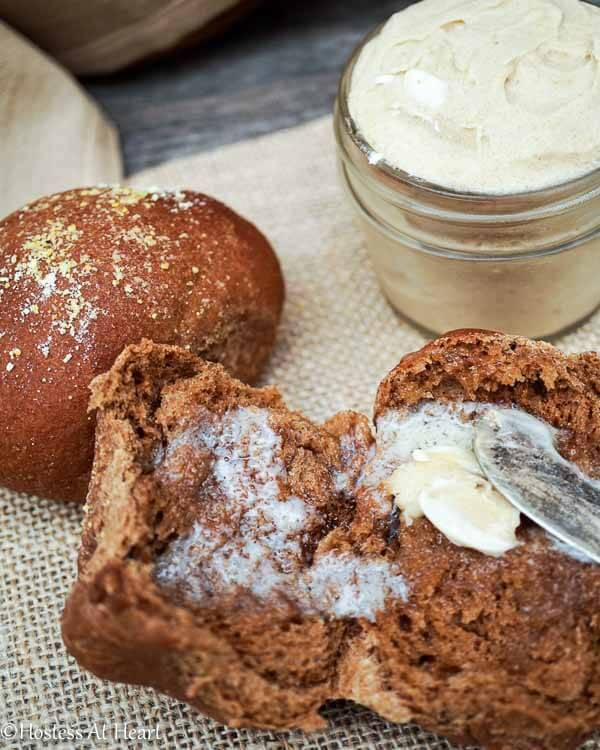 This Sweet Molasses Brown Bread Rolls recipe was created during a challenge for “sweetbreads”. There are tons of sweetbreads, but the intention was to make bread that requires yeast. I love cinnamon rolls and those sweetbreads, but I wanted to try something just a little different. I wanted to make a brown bread that can be served with a savory meal. Such as those brown bread rolls that have a slight sweetness to it but isn’t all about the sweetness. I found this recipe by “its always autumn”. You really should check out her website. This gal does it all! She “claimed” that this bread was a knock-off of the Outback Steakhouse brown bread. Well, I haven’t been to Outback for quite some time, but remember those rolls very well. They serve it warm on a breadboard with their own whipped honey butter. I had all of the ingredients, so that was the clincher. When I had put my dough together, it was quite stiff. I really wondered if this bread was going to be light and soft. Well, I said I wasn’t a bread scientist because these rolls were all of that. While my rolls were baking, I put a stick of softened salted butter in my food processor with 1/4 cup of brown sugar and a tablespoon of honey and whizzed everything together until it was creamy. I then put it in a jar. Oh my, I could slather that stuff on anything and go back for seconds! Slathered on these rolls is something close to an out of body experience. Soft Sweet Molasses Brown bread rolls are soft and delicious. 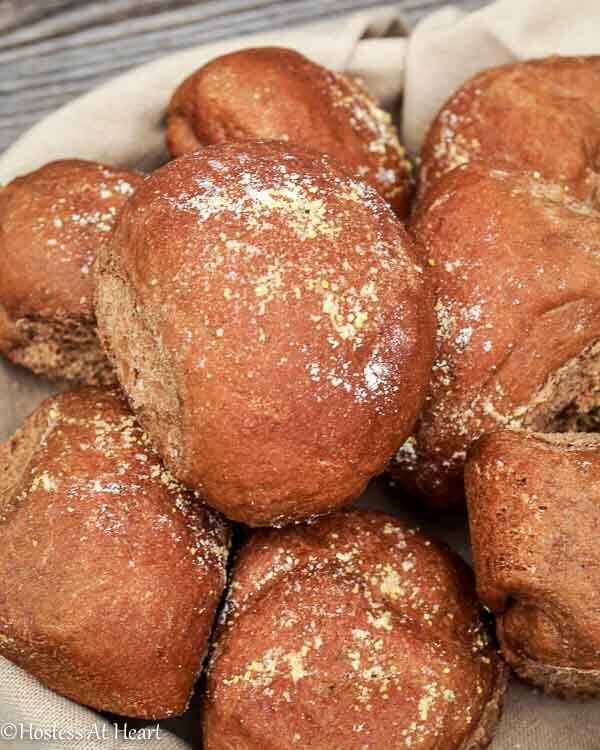 Molasses, honey and whole wheat flour give these rolls a mild sweetness and great flavor, especially when slathered with brown sugar butter! Combine warm water and yeast in the bowl of a stand mixer and let sit for 10 minutes. Combine all remaining ingredients, except for the whole wheat flour and mix together using the paddle beater. Scrape down sides and mix until just combined. Change beater to the dough hook. Add one cup of the whole wheat flour and mix on low until combined. Gradually add another cup of whole wheat flour until dough starts to ball and leaves the sides of the bowl. Beat on low for 7 minutes, adding additional flour if necessary. Turn dough out onto a lightly floured surface and knead until tight and smooth, 4 to 5 times. Place in a large lightly oiled bowl, turning once to oil both sides of the dough ball. Cover and allow to rise until doubled in size, 90 minutes. Punch down dough and form 16 rolls. Place in a greased 9X13 inch pan and allow to rise again for 1 hour. Nutritional value doesn't include brown sugar butter. 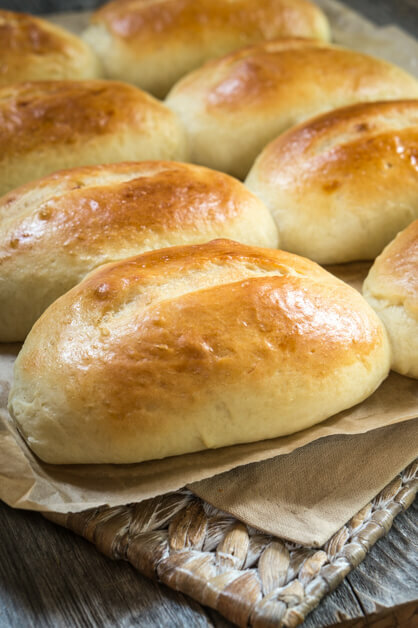 We really enjoyed these rolls, and even though I bake a lot of bread it reminded me that I need to make rolls more often. Oh and that butter would be delicious on pancakes or waffles too. I’m just drooling thinking about it. I had a great time baking for this challenge. 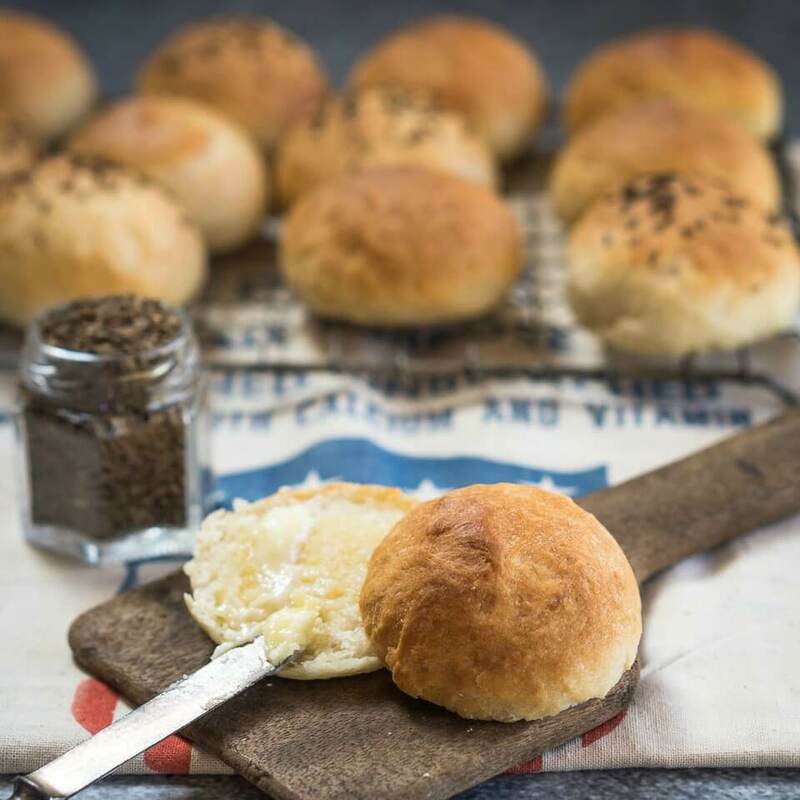 Here are a couple more bread rolls that I really enjoyed and have baked several times. I love fresh homemade v=bread & this looks fabulous. That molasses looks like it’ll add the perfect amount of flavor and moisture. Thank you, Debi! This is one of my favorites too! Thank you so much Winnie! After looking at your site and seeing how talented your are, that is indeed a compliment! I appreciate your visiting! This bread sounds perfect, I just love molasses, and with that butter, you just can’t go wrong! Thank you! I like trying whole grains when I can, and these came out soft and delicious. definitley lovin this for my brunch in the clinic…. Thank you Dedy! Please let me know if you give them a try. Can’t blame him, I would be tempted to do the same! Thank you so much Jess! Happy FF to you too! I’m thinking these rolls would be lovely to serve at a dinner party I’m having next week! I may have to sneak a couple just for me with that brown sugar butter…oh, my!! Thank you Lora! Please let me know if you try them. Enjoy your weekend! Delicious looking Julie. You bake like a pro!! You are so darned sweet skd! Thank you! Thank you Sonal! John just loved that butter! And, we both just love homemade bread. Thank you so much! They were pretty yummy too. This bread looks delicious! Love the look of these and I have some molasses to try it! Thank you! I hope if you get to make them that you will let me know how you like them. Thank you so much Jewels! Thank you! They were very easy to make, and I will definitely make them again. Their slight sweetness goes perfectly with a savory meal. I hope you will let me know how they turn out when you make them! Ooh, good reminder about that slightly sweet, warm bread! I think I’ve seen that “it’s always autumn” recipe and bookmarked it somewhere; happy to have it back at the front of my mind. Also, that whipped sweet butter? Please! Sounds so dreamy. I agree Tracy! Thank you for stopping by! Once again, perfection! Warm bread and melty butter can’t be beat! Thank you Patti! I just love fresh bread and home baked is so yummy. Yum, yum, yum! I haven’t been to Outback in a gazillion years, but I do remember this bread … and I am totally going to make your version … with that butter too! Thank you Kimberly! My husband suggested that I leave lumps in the butter. I’m surprised he didn’t just dump brown sugar on the rolls! I haven’t been to Outback either. My husband makes to darned good a steak at home. Thank you Ana! John is still licking the empty butter jar. He said next time leave brown sugar lumps. Glutton! I love the sound of these, and I’m thinking they’d be the perfect thing to slide into one of our holiday bread baskets. Plus that brown sugar honey butter…mmmmm! Thank you Heather! I do love when several kinds of rolls are served and I secretly hope to get a certain one while waiting my turn. I’m such a kid. I would love a report! I do get flour showers once in a while too. Especially if the mixer is involved. I went to Outback probably 25 years ago and wasn’t very impressed. but these breads do look fabulous!!! Thank you Mimi! My husband can make one mean steak so between the sodium and fat in those commercial steaks we don’t do either. This bread was yummy though. Thank you Amanda! Easy and delicious. Make sure your cover it in buttterrrr! It isn’t very sweet at all, especially if you don’t put the brown sugar butter on it. Thanks for stopping by Elaine! Thank you Loretta! This was a new one for me and the dough was not soft. It was actually very dense but they came out soft and boy did my kitchen smell good! Please let me know what you think. I can’t wait to try this recipe! My mom used to make a sweet, brown bread when we were children—so delicious!!! Thank you Liz. I’d never made it before but had eaten it and loved it. Thank you! I appreciate your stopping by and taking the time to comment!